Now that’s how you celebrate Mother’s Day. 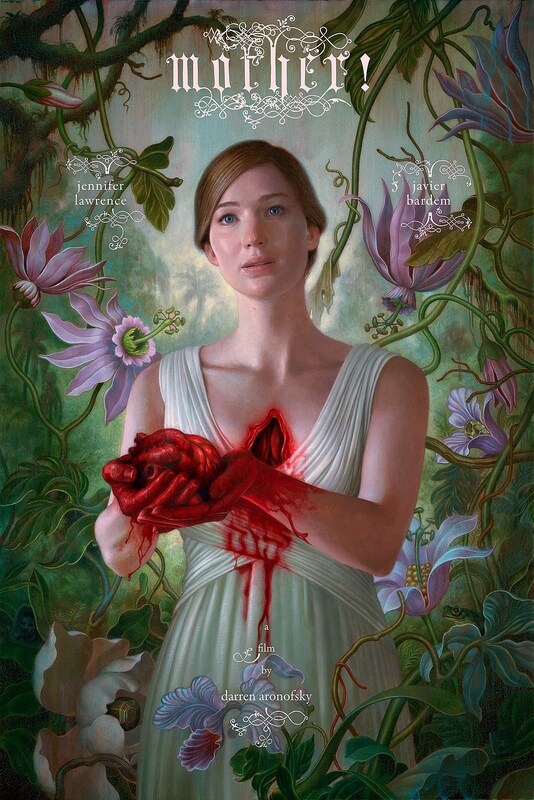 Earlier today, filmmaker Darren Aronofsky shared the first poster for mother!, his new horror/thriller featuring Jennifer Lawrence and Javier Bardem. With an angelic expression on Lawerence’s face in the above excerpt, you might be forgiven for thinking that this poster is a kind and gentle teaser for a movie that is more creepy than graphic. Well, by all means, don’t let me stop you from scrolling down to reveal the full horrifying artwork on the mother! poster below. This degree of graphic violence (painted or otherwise) shouldn’t come as a surprise to anyone who knows Aronofsky’s work. Aronofsky broke onto the Hollywood scene with Pi, a movie where a man suffering from psychological delusions drills a hole in his head. There’s also the graphic injuries in The Wrestler, the body horror of Black Swan, and, uh, pretty much everything that happens in Requiem for a Dream. Suffice to say, Aronofsky has spent his entire career just on the other side of the line between horror and dark drama, so if this poster suggests he’s finally decided to go for broke, I’ll be very happy to see what he comes up with. We’re still without an official plot synopsis for mother! yet, but the film’s brief summary — “A couple’s relationship is tested when uninvited guests come to their home” — suggests that Aronofsky is offering his take on the home invasion movie. What we do know about the film is its impressive cast: in addition to Bardem and Lawrence, mother! will feature Michelle Pfeiffer, Ed Harris, Domhnall Gleeson, Stephen McHattie, and Kristen Wiig, making this probably the best-acted horror film you’ll see in the next couple of years. The film is scheduled to be released on October 13, 2017, which means that we should see our first trailer for mother! in a month or two.